l-r; Eric Cleveland, Corporate Executive Chef and Director of Culinary Innovation; Sgt. David Windus; Lt. Jason Proctor; Captain David Corman; Sgt. 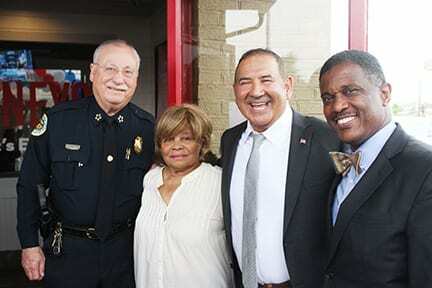 Scott Hull; Officer Angela Booker; Ms. June, Tennessee Tribune and TSU; Sgt. 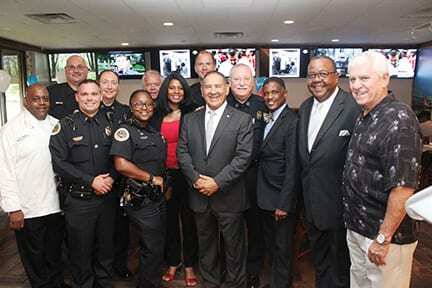 Jonathan Marklein; David Davoudpour, Chairman and CEO of Shoney’s; Chief Steve Anderson; Pastor Howard E. Jones, Jr. Assistant Vice Principal, Metro Schools; Juan Gipson, Franchise Business Executive for Shoney’s; and Hope Hines, retired sports director, WTVF NewsChannel 5. 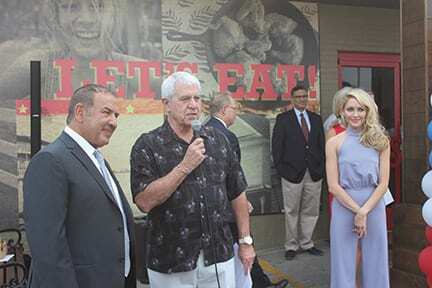 NASHVILLE, TN — Under the direction of Mr. David Davoudpour, one of Shoney’s brand standards is giving back to the local community. 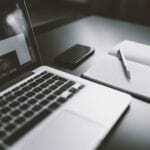 This special event epitomizes that business belief. 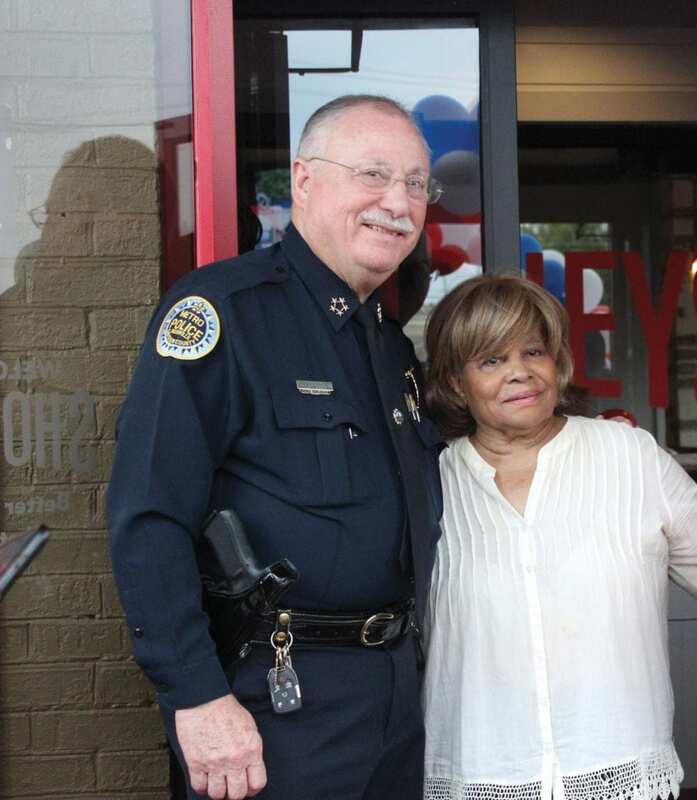 • Leave it to the Nashville-based, All-American iconic restaurant brand Shoney’s to bring together at-risk youth and the Metropolitan Nashville Police Department for a great meal at America’s Dinner Table. 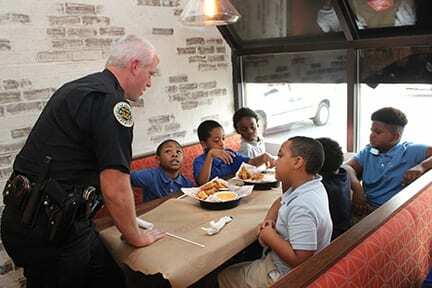 • More than 100 young boys was treated to a southern-style meal and the ability to interact with the MNPD. • The Dinner for Hope – Inspiring Nashville Youth is the second-type event in the Nashville area and fulfills Shoney’s commitment to giving back to the community. 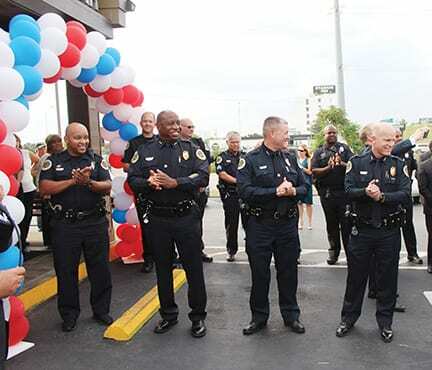 • The Interstate Drive Shoney’s is next to Nissan Stadium, where Shoney’s hosts its annual 5K Family Fun Run, which in 10 years has raised nearly $250,000 for the MNPD in order to offer tuition assistance to officers. • Shoney’s is one of the first, and has always been one of the most popular, family casual dining concepts in the United States. 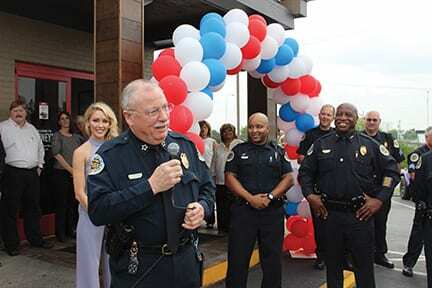 • While the Shoney’s on Interstate Drive recently re-opened, this event is in lieu of a grand opening. Shoney’s is a Nashville-based company that operates in 17 states and is now growing through franchising following an extensive revitalization effort. Since its humble beginnings in 1947 as a Charleston, West Virginia drive-in restaurant, guests have enjoyed Shoney’s family-friendly, casual dining experience. Visit www.shoneys.com for more information on restaurant hours, locations and special offers. 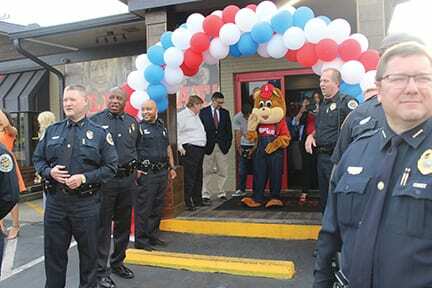 Shoney’s is offering franchising opportunities to qualified single and multi-unit candidates. In order to get back to Shoney’s “Glory Days,” the brand is now growing through franchising, following an extensive revitalization effort. 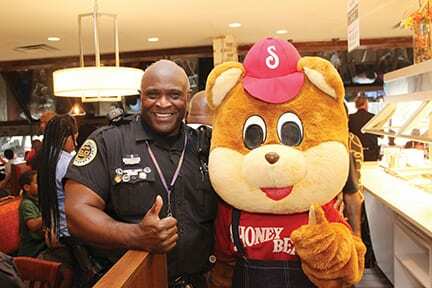 Shoney’s is offering franchising opportunities to qualified single and multi-unit candidates. For more information, visit http://www.shoneys.com/franchise/. Backfield in Motion is a non-profit organization that focuses on education through mastery of literacy and numeracy skills for at-risk males that leads to a high school diploma, a foundation for higher education, and the on-job skills needed to enter the world of work, while using athletics as an incentive for academic improvement. Backfield in Motion programs are designed to Educate, Engage, and Empower young people from some of Metro Nashville’s most underserved communities in a continuum of services from elementary school all the way through high school and beyond. Its Metro Nashville’s programs teach youth the critical skills they need to be successful in school and in life, and then give them the opportunity to practice and develop those skills in a safe, supportive environment. Starting with 7–10-year-olds in our elementary school program, through middle school, high school, college and beyond, Backfield in Motion engages hundreds of young men each year during the crucial out-of-school hours when they are most at-risk. 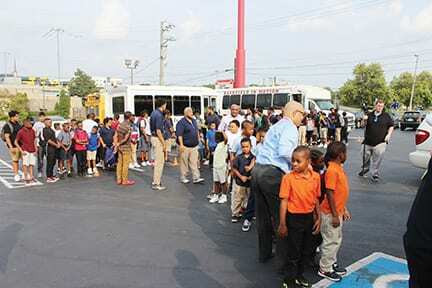 Awaiting the students entrance into Shoney’s are l-r; Deputy Chief Todd Henry, Deputy Chief John Drake, Sgt. Jonathan Marklein and Deputy Chief Damian Huggins and Shoney Bear. 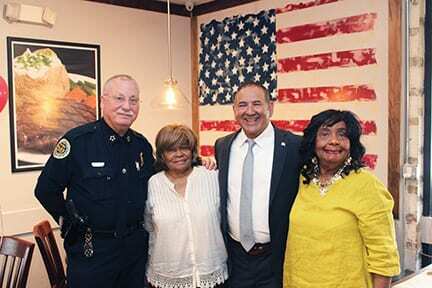 Hope Hines, center, retired sports director, WTVF NewsChannel 5 led the students in the Pledge of Allegiance and introducing David Davoudpour, left, Shoney’s Chairman/CEO, who welcomed the students to their 2nd annual Dinner for Hope. l-r; Officer Tevares Hockett, Deputy Chief John Drake, Deputy Chief Todd Henry, Deputy Chief Brian Johnson greeting the students. 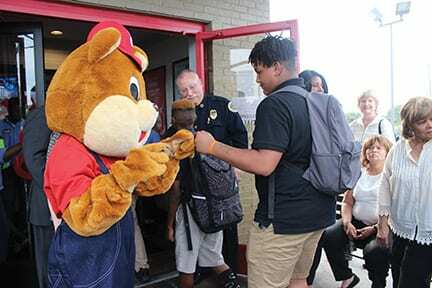 Officer Mark Bennett and Shoney Bear welcomes the students to their 2nd annual Dinner for Hope. 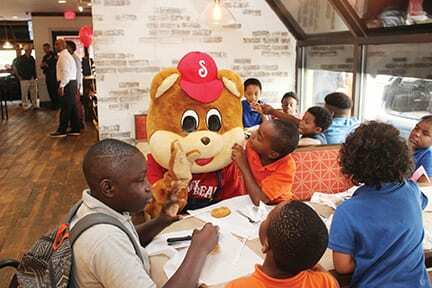 Children from Backfield in Motion enjoy time with Shoney Bear. 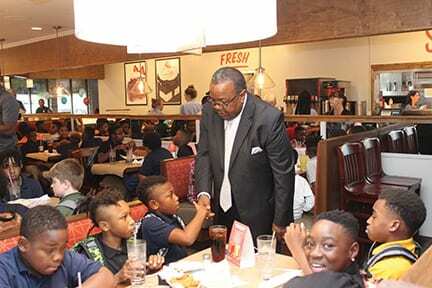 Juan Gipson, Franchise Business Executive for Shoney’s, welcomes the students to Shoney’s. Officer Bradley Rumbley told the students what it takes to become a police officer, what police officers wear, how they get around, and how they help people.